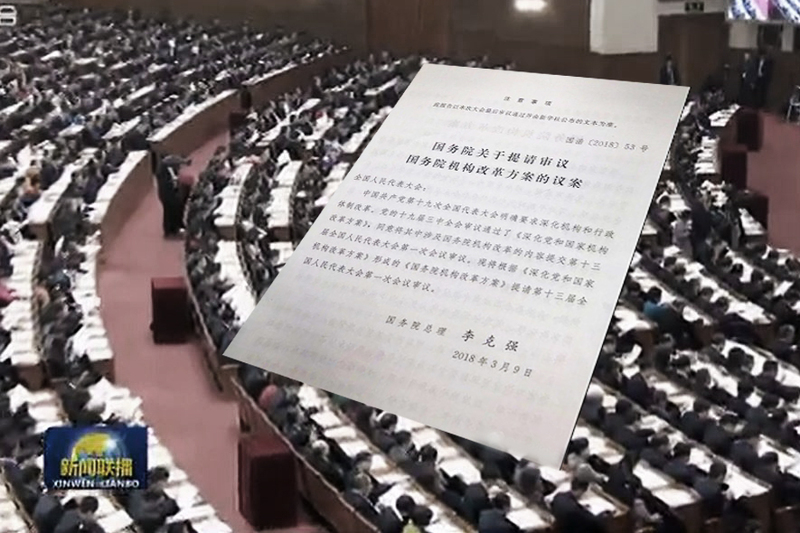 ◎ The 13th NPC deliberated a plan to reform State Council institutions on March 13. The 13th National People’s Congress (NPC) deliberated a plan to reform State Council institutions on March 13. According to remarks by Chinese premier Li Keqiang, there will be 26 ministerial and vice-ministerial agencies (not including the State Council General Office) under the post-reform State Council. 4. The creation of an International Development Cooperation Agency. 1. The CCP carried out seven large-scale institutional reforms in 1982, 1988, 1993, 1998, 2003, 2008, and 2013. While the reforms were ostensibly about streamlining government, the reality saw the upper bureaucracy push down its problems to the lower bureaucracy. As a result, the various institutions started hiring more personnel and became bloated. Efficiency dropped and the grassroots governments were heavily burdened. For example, state media reported in 2006 that the poverty-stricken Huoshan County (per capita income of only 880 yuan) had a government comprising a county chief and 11 deputies. Of the deputies, seven were locals, while the remaining four were temporarily assigned to the county by different higher authorities. 2. The CCP never dared to undertake sweeping institutional reforms and ax surplus officials because it was never able to fully resolve its legitimacy crisis. This legitimacy crisis is born out of the CCP’s brutal suppression of the Chinese people and its Soviet connections. During its foundational years, the Soviet Union fostered the CCP to supplant the ruling Nationalist Party (Kuomintang). Later, the CCP would leverage on opportunities provided by Japan’s invasion of China to oust the Nationalist Party from power. After establishing the People’s Republic of China, the CCP persecuted tens of millions of Chinese people in political campaigns big and small. Some scholars estimate that over 80 million Chinese died unnatural deaths under CCP rule, or a far higher death rate than during the Japanese invasion. 1. The Xi Jinping leadership’s institutional reforms appear to be chiefly aimed at restructuring the relationship between the central government and the regional authorities. The reforms will also strengthen the Party’s vertical control over the state apparatus. Duplicate ministries or agencies are being merged to minimize institutional costs and increase efficiency. 2. The merger of taxation agencies allows the central government to strengthen the CCP’s authority and control over fiscal affairs to ensure more efficient collection of real estate tax and resource tax. 3. The change from a “bank and three commissions” system to a “bank plus two commissions” system indicates that China faces immense financial risks, yet Xi lacks trusted and capable officials to streamline the financial oversight structure further. 5. The International Development Cooperation Agency is geared towards complementing the Belt and Road Initiative and the CCP’s economic expansion strategies. 6. We believe that the sweeping institutional reforms are interlinked with the scrapping of presidential term limits. Without the prospect of Xi ruling “indefinitely,” Chinese officials may feel that he is going to be a lame duck leader and end up implementing Xi’s institutional reforms half-heartedly and incompletely. Whether or not Xi will be successful in his reforms will hinge on the outcome of the Xi Jinping-Jiang Zemin factional struggle. It is unclear how many Chinese officials will either switch allegiances or pivot to Xi.